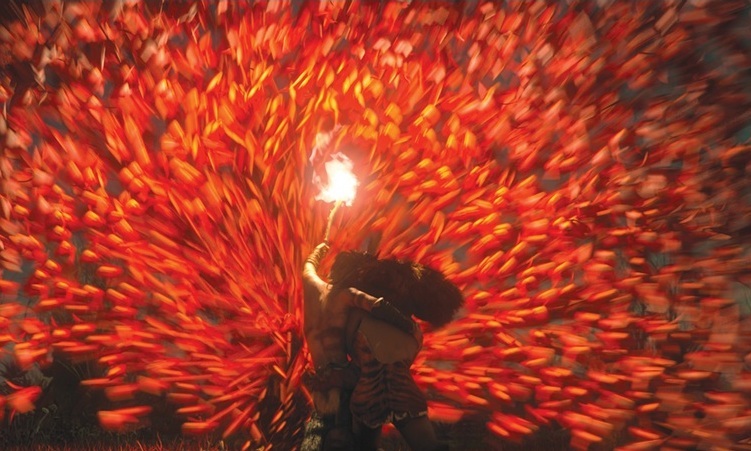 Dreamworks Animation continues to raise the bar for animated features with their newest feature film titled The Croods. 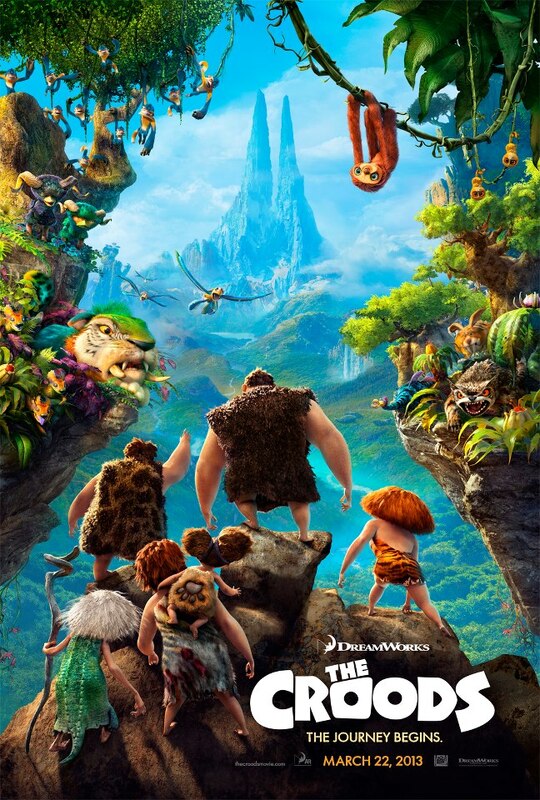 Nicolas Cage, Emma Stone, and Ryan Reynolds provide their voice talents to help create a prehistoric three dimensional adventure like you've never seen before. The Crood family has survived for generations under the philosophy that living in fear and hiding from virtually everything the world has to offer is an acceptable way of life. 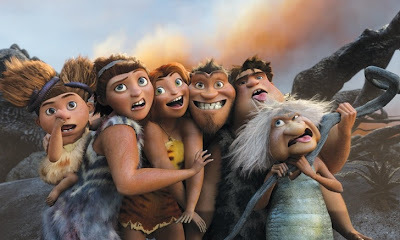 With an extensive historical record of similar families who perished by venturing out into the world, they have chosen to reside safely in their cave dwelling and only venturing out when in need of food or other essential resources. 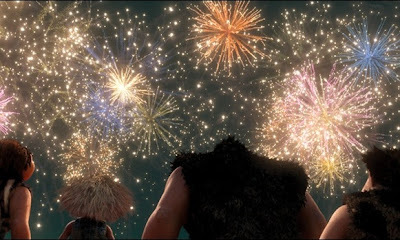 Grugg (Cage) and Ugga (Catherine Keener) have done well in keeping their family safe over the years, but their teenage daughter Eep (Stone) has aspirations of living a more fulfilling life. 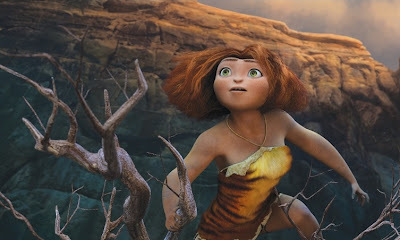 After stealing away from the cave during the increasingly dangerous night time hours, the young cave dweller finds the adventure she's been seeking when she meets a strange boy named Guy (Reynolds). The intriguing stranger impresses Eep by showing off his advanced technological skills like fire and shoes, as well as his monkey companion who is aptly named Belt after his main purpose as a pet. When a natural disaster strikes, the Crood clan must venture off in search of a new home and they reluctantly choose to follow Guy's lead as he predicts even more impending doom for the land they have inhabited for as long as their family stories allow them to remember. 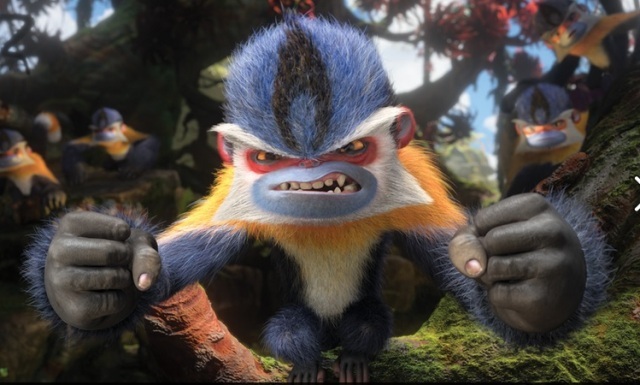 While the newly created team of Chris Sanders and Kirk De Micco each have a fairly small amount of directing experience, the animated pictures they have individually created have had a pretty solid track record including How to Train Your Dragon and Lilo and Stitch, as well as the not so successful Space Chimps. 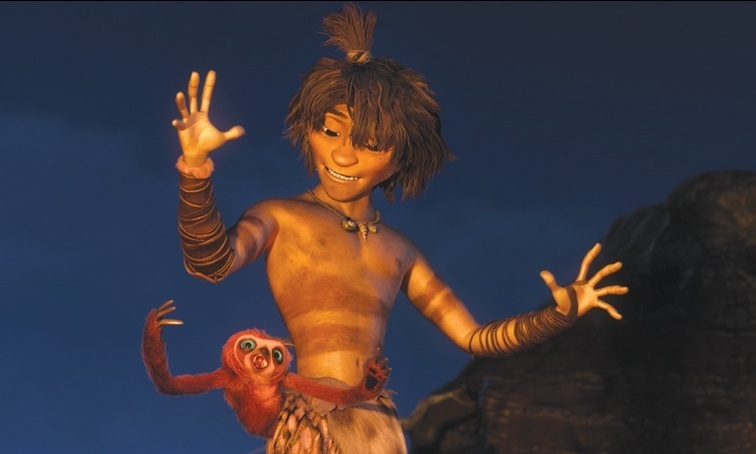 After watching The Croods, it has become very clear that combining forces was a great idea as this movie is genuinely funny, extremely entertaining, and visually about as beautiful as you would ever imagine a 3D animated movie could be. 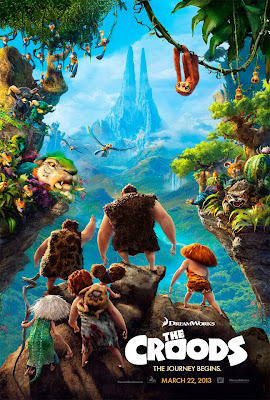 Cartoon movies can definitely be a hit or miss proposition as so many promise to be epic tales of adventure but fall flat with paint by numbers storytelling that is glossed over by flashy visuals. 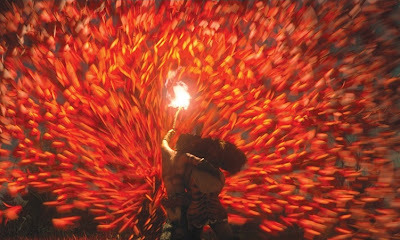 What The Croods gives you is the best of everything that makes this type of movie work. Kids will love the humor and the eye popping animation while adults will appreciate the great story that doesn't depend on bathroom humor or pop culture references to keep everyone entertained. Go see this movie as soon as you can and see it in 3D. The images from the opening scene through the closing credits are well worth it and everything is tailored perfectly to the format. As you watch all the hilarious clips in the the trailer below, you might be worried that they put all the good stuff in the trailer. Well, rest assured that there is so much more to enjoy, you will want to watch it again just to catch everything you missed the first time around.